After just half hour navigation from Piombino to Portoferraio, the idea that the island of Elba is small soon changes when you see the endless, beautiful rocks that roll out before your eyes. These ten suggestions of places not to be missed on Elba, are the result of a lifetime of experience on the island and the desire to give you the best possible idea to maximise on the singular reality of its beauty, its ancient history, and unrivalled landscapes alongside a humanity that has always lived on the limits of isolation with pride and an ancient wisdom that today is fast disappearing, being watered-down and corrupted by tourist commercialisation. If you combine, weather permitting, these ten visits with the ten experiences proposed in my previous article, you will begin to know the island of Elba reasonably well … but just half of it isn’t really enough! The first place that should be pointed out is glimpsed every year by hundreds of thousands of people, but only a small part of them will devote a few hours to visit the island’s capital. Many people simply think that Portoferraio is the just the main port of disembarkation / embarkation for the continent, so, a mere passing place, noisy, modern and insignificant like many other non-places and maybe even polluted. In support of this rather unfavourable assumption is the negative visual impact of two large high blocks of flats built in the sixties that stretch out before the dock where the ferries disembark cars and passengers. I share the view that the port area should be carefully avoided, but if you just dedicate half a day to the historic centre and to the beaches of Portoferraio, you will have some really pleasurable experiences. The old town is, in fact a sixteenth-century fortress, founded by a warrior prince of the Medici lineage, and in this blog I will explain how the city originated. It was founded in 1548, a particular moment in time for the history of the Florentine Renaissance, and it was built for military strategic reasons, established on an ancient Roman settlement and later, in medieval times, it was quickly rebuilt as a new, cosmopolitan city, and so renamed for the occasion: Cosmopolis. Leave your car after the commercial port and take a walk along the old Medici harbour, to the old town which was Cosmopolis. That alone will be spectacular. Along the way enticing fashion shops and some “new age” bars will introduce you to the fortified city, once inside, you will find some good restaurants, pizzerias, and some nightlife, but most of all you should go along the ancient lanes that lead to the two forts dominating the city: Forte Falcone and Forte Stella which you can visit by paying a modest entrance fee. From the top you can admire the white cliffs of Portoferraio that I described in this article and this will forever eliminate the idea that Portoferraio is just a place of transfer. 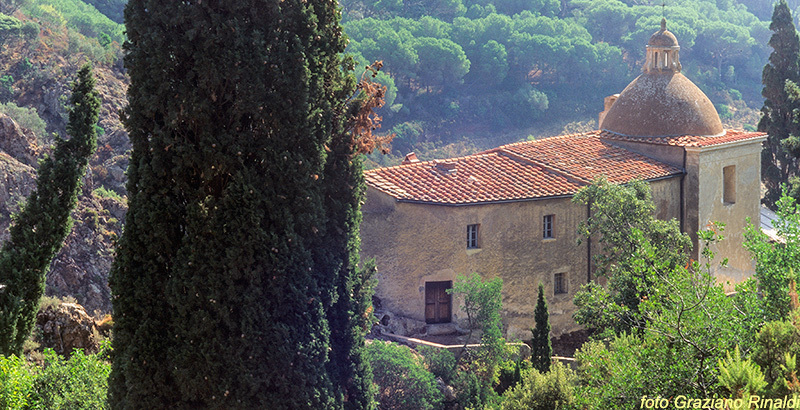 Another thing you can visit between the two forts is the official residence of Napoleon, the other is located in the countryside, but this is the one is where the former emperor spent more time and is even more interesting from the landscape and archaeological point of view. In this article I wrote about the arrival of Napoleon on Elba and of a woman who had an enormous influence on the little big man. At this point you have two choices: go down the side of the Martello Tower, the sea fortification which today houses the Archaeological Museum, or go towards the land entrance. In either case, you will not regret the choice. So, I’m sure that you won’t have regretted spending a few hours in this Renaissance city so very martial but just as lovable. To visit this historical place, prepare yourselves for a walk of at least 40 minutes / 1 hour of steep climbing. Already this sorts out who visits it. But if the climb doesn’t discourage you, the prize will be greater than the sacrifice. This is the symbol of the island- the fortress which has never been conquered: a fortification that stands on a steep red rock hill opposite the Gulf of Portoferraio. 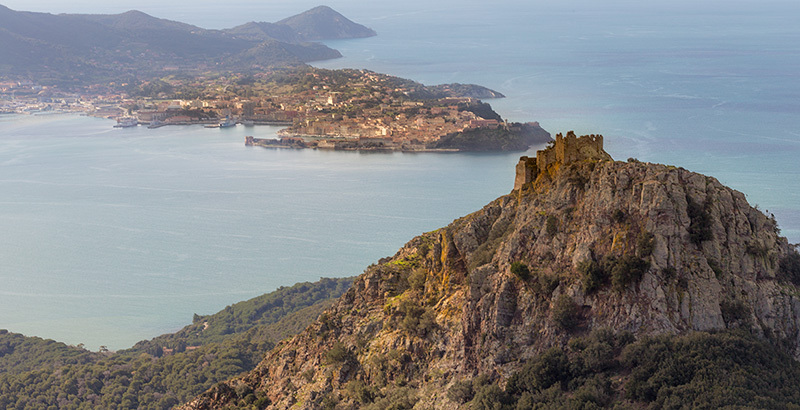 It’s name is the Castle or Fortress of Volterraio, restored in 2015 by the National Park, and is one of the most enchanting destinations on the island of Elba. I understand that not everyone can engage in this challenging outing, but if you can, then do it. Before launching yourself on the path, leave your means of transport parked in a well signposted car park along the road that connects Portoferraio with the eastern side of the island. 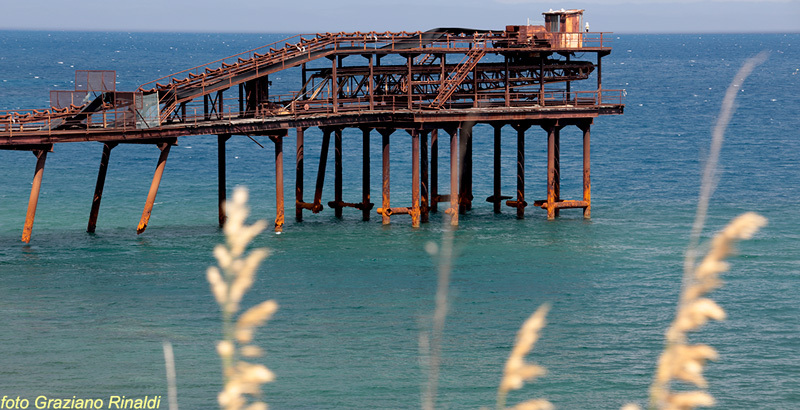 In fact, this was the actual role of the fortress: to control and defend the passage of the iron ore extracted to the east and carried into the Gulf of Portoferraio. 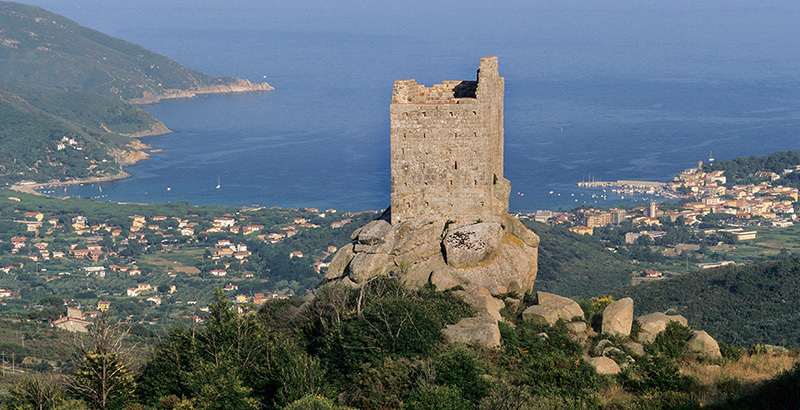 Actually Volterraio is a castle with very ancient origins, certainly it was already there in pre-Roman times, the Etruscan period, then, in Pisan-medieval times it became a watchtower, connected with the other similar towers scattered along the strategic heights of the island. They probably communicated with each other by fire / smoke signals (just like you see in the “Lord of the Rings”!). It was enlarged and restored until the seventeenth century, only to fall into ruin, we imagine to the great relief of the soldiers of the garrison ordered to this remote place in the Mediterranean. I invite you to read this short article on the nest of vultures, since it seems that the name Volterraio results from the Etruscan word, vulture. My advice is to tackle the short but intense ascent in the late afternoon, so that you can watch the sunset with its warm colours enveloping the gulfs and the scenes of the hills below, it is certainly one of the most poignant sights of the whole island. 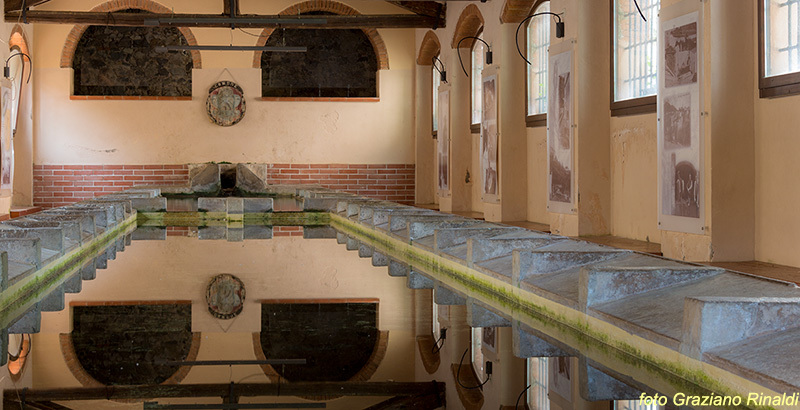 It’s been a little over fifty years since they have fallen into disuse, but a visit to the old wash house of Rio nell’Elba takes us back to a time that seems archaic. And if this one of the most visited places of the eastern side, it deserves it, and it will lead us on to visiting other interesting environments. The wash troughs as we see them today were built after the unification of Italy, precisely in 1873 and later remodelled, originally they were located just above, where now you can see the water pumping station. Inside you will find descriptive panels with detailed explanations and outside more information on the National Park, displayed right next to the washrooms. What remains today of this ancient institution is the feeling of intimacy with the ancient people of this small hill mining village. Long before the nineteenth century wash houses have represented a place of socialization for the people of the town who had no running water at home, the women went there to wash the clothes and men, almost all miners, washed off the black hematite earth before going home or stopping at the inn. But over an above the architectural and historical arguments, try to “breathe”, in the atmosphere of the old wash house, the ancient history of a mining civilization, going back centuries ago. What you discover, among other things, is a different culture of the source of water, just above the wash-houses there are in fact the old springs, today little streams, but obviously in the past, when there was more abundance of the precious liquid, it had to be a great spectacle. Along the streets of the small hillside village, one of the island’s oldest if not the oldest ever, you can read a few extracts of medieval statutes attached to the old walls of the town. In short, in and around the old wash houses of Rio nell’Elba you can enjoy a taste of the island that no longer exists. Until a few years ago this was an inaccessible prison for those serving long term sentences, but with the closure of the this maximum security prison and opening of the National Park, it has meant that the island has been gradually exposed to tourism. Today a small line ferry leaves every day from Marina di Campo on Elba and in 45 minutes you can be on the legendary island of Pianosa. For information on times and fares call the number +39 0565.963006. In case you are interested, before booking any holiday accommodation, I suggest that you take a look at the elbavacanze site for rental offers each year, they rent in Marina di Campo, as well as many other places on the island and as a free promotion offer tickets to visit the island . For diving on the other hand, get information from Riccardo, the owner of Diving on Elba: info@divinginelba.com and watch this short video: “A pristine underwater treasure”. For those who are going to stay at least one week on Elba, the small island of Pianosa is certainly a place to visit, on foot or by bike or simply enjoy the turquoise to deep blue sea of Cala Giovanna, the only beach where you are allowed to swim … but do not worry about this limitation: the sea bed is so full of life that you will be busy for a long time ‘. If you’ve never been there you should glance at this short post: Pianosa Island, first impressions : where, apart from several photos that give an idea of the island, there is a description of why being here is so special. And if you’re really curious to savour the island at dusk and dawn, you can book into the only hotel, Hotel Milena, which in the simplicity of its 10 rooms offers you a unique opportunity. Pianosa is surprising in so many ways, but there is one that you that you won’t expect, and which astounded me too and you can read why in this post: The Island of Silence. Something that may surprise those who are not familiar with Elba, is its diversity, whether natural and cultural, that you can enjoy in the landscape or in the human variety, although this second feature has been very diluted over time. For example, a powerful strong seventeenth century fort remains, now used as a prison, and where over time at its foot, one of the most delightful seaside villages of the island, Porto Azzurro, has developed. You can get an idea about it from photos and information in this article. Porto Azzurro was the Spanish enclave on the Island of Elba in the seventeenth century, and in addition to the obviously Spanish surnames of many of its inhabitants, there are strong resonances in the architecture of Fort San Giacomo and Forte Focardo, which is on the other side of the bay facing the town, in the marble of the church and also in the narrow streets of old town. But in this corner of the Mediterranean the most poignant reminder of Spain is the shrine of Monserrato. 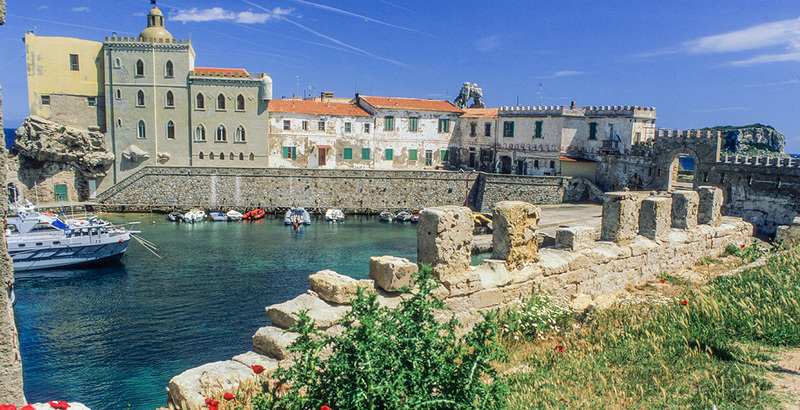 It was built exactly in 1606 by the first governor of Longone (Porto Azzurro until 1947 was called that! ), a certain Don Jose Ponce de Leon, a great devotee of Nuestra Senora Morena, the “Black Madonna” preserved in the monastery of Montserrat , an hour and a half drive from Barcelona, Catalonia. Although between the two monasteries there is no architectural similarity, however something that will capture the imagination of the visitor has to be the environmental context of the two sanctuaries. And this is an aspect that will certainly give a lot of pleasure, so it really shouldn’t be missed. 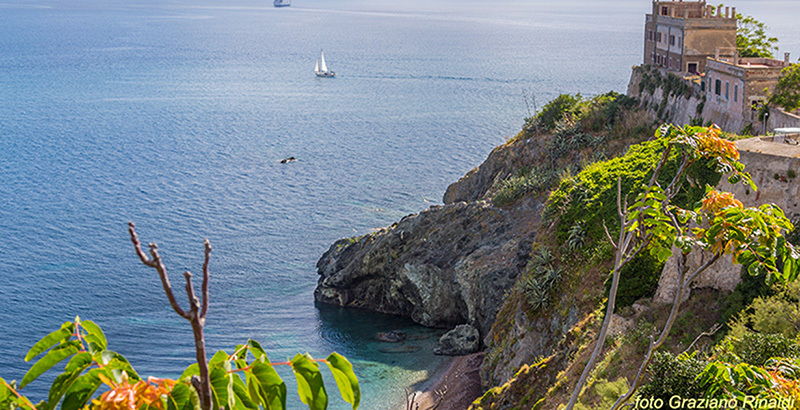 The sanctuary is set into a harsh natural amphitheatre of reddish hills that give the small church a truly romantic charm, the same thought probably struck Napoleon in September 1814, when, during his exile on Elba, he visited the small sanctuary. Although you will probably find it closed, as happens frequently, you will not fail to admire the wonderful panoramic views, with the apse facing the hill ranges and the churchyard facing towards the sea, then if you happen to be there from 01 June to 15 September between 09.30 and 12.30 and 15:00 to 7:00 p.m., you should be able to enter. Once inside in the Spartan simplicity you will discover a seventeenth-century painting, commissioned by the same Jose Ponce de Leon, depicting a black Madonna. It is often said that is a copy of that of Montserrat, but in the Spanish monastery it is an statue in rock, not a painting. On the side of the hill there is an old, tiny aqueduct that until a few years ago drew from a source of water in the hills but today it is quite dry. To get there you have to take the road that leads from Porto Azzurro to Rio Marina and after a few minutes drive you will see on the left a junction with the sign leading to the sanctuary. You can decide whether to leave the car next to the big pine on the left of the road and walk for 10-15 minutes or park just below the sanctuary. In all cases, a short distance from the shrine, you can’t miss a beautiful Spanish-style building adorned with dozens of orange trees, which used to be hermitage and which today has been transformed with really good taste into a beautiful Bed & Breakfast, 5 bedrooms complete with sun, the orange grove and a hot tub. If you belong to the category of those who don’t like going to monuments, you will love this church anyway. It is four outer walls of an ancient Romanesque church, built just after the year one thousand, it doesn’t have a roof now and is covered in vegetation. 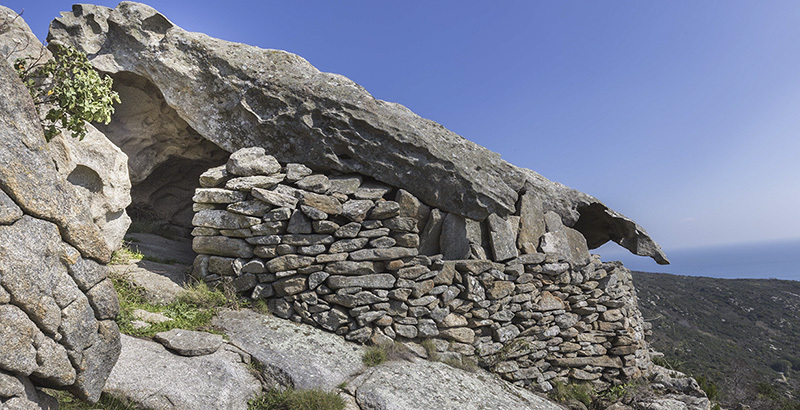 From an architectural point of view you will appreciate the austere simplicity, with its granite blocks one on top of the other each carved with precision usually reserved for precious stones, they have stayed intact for 900 years with mortar and have lasted longer than work carried out in more sophisticated reinforced concrete works. But even if the Romanesque architecture of the Elban Middle Ages doesn’t excite you, you will still love the place and you’ll appreciate it even more if you arrive in the courtyard of the ancient church of San Giovanni coming from the small hilltop village of San Piero (I recommend reading this article). After little more than a half-hour walk along a path above the village (where you will have left the car) you’ll find it well indicated and immersed in a centuries-old chestnut forest. Immediately after following the turn of the path you will come to the church, and so can enjoy, after 30/50 minutes of solitude, the comfortable presence of a sacred and safe place. It must always have been a place of worship and a point of crossing from one side of the mountain to the other. Within a few hundred metres, there is a beautiful recently restored watchtower, built on a large granite boulder, also in the same period of the Church. Among the chestnut trees, a short distance away, there is the sixteenth-century hermitage of San Francesco Saverio, a Spanish missionary who was among the first to travel to the Far East. During the middle season there is a flowing mountain stream near the hermitage that forms a beautiful, green micro habitat, you can see some photos and read an article which is about these freshwater streams on the island of Elba in this post. There is much to see around the largest of the Elban Romanesque churches and if you like the fresh natural life you can also consider this place for a picnic. During the course of history, this town has held a leading position for many centuries, from when it was a simple point of call for merchant ships that were to take on iron ore, to when it become a real industrial town in the last 2 centuries. Then the hematite mines, the same ones exploited by the Etruscans 2,500 years ago, closed their doors and Rio Marina had to deal with the years of mass tourism. It was like putting a rugby player in the role of centre forward in Series A football, despite having all the qualities of a champion he had to adapt to a game that he did not know. It took a few decades, but today Rio Marina has definitely taken the initiative in monoculture tourism on Elba. And just by making a late start it has been able to preserve some features that you won’t find elsewhere. But to find out … you have to go, but read this article first. What you will find in particular? Even the most meagre of tourist guides, will tell you about the guided tours to ancient mining sites or visiting on board a “train” by buying a ticket at the local Mining Museum (Tel and info +39 0565 962088) located in the historic district. This activity can be recommended even to the laziest visitor, then if you have children in tow, you will have a great time when the conductor of the train stops to invite you to look for pieces of ore directly on the ground and even if you don’t want to play at being ancient miners, undoubtedly the colours of the mines under the open sky of Rio Marina will amaze you.. Visiting the town will show you that everything still revolves around the iron mines, which true in part, but while there were once an impressive amount of dark and poor taverns, today you will find some of the best restaurants and pizzerias on the island, a good promenade surrounding the marina and small glistening sandy beach. If you want to spend a few more hours around this part of the island, I suggest the beaches with metal- like sand you will find in Rio Marina and Cavo (see this post on Cala Seregola), or maybe you’ll decide to spend some time on the small southern beaches encountered along the scenic route starting from the town you can’t really go wrong, in any case read this article that will give you a precise idea of the area. Seen from the mainland, it is clear that the island of Elba has two almost symmetrical headlands, one at the centre at the village of Porto Azzurro, and to the north the red earth of Rio with its ancient open iron mines, to the south the promontory ends in inaccessible, ancient cliffs, the kingdom of the seagulls and dominated by Monte Calamita. Also the promontory of Mount Magnet is a territory of mines, here however, hematite wasn’t mined in such large quantities as in Rio’s open mines, but instead they mined the dark magnetite in a large underground mine, open today for sightseeing (for information and tickets +39 0565 935 492), it’s a large mine shaft with several very large galleries going down to more than 50 meters below sea level. Mount Calamita is dominated by a very small , old hilltop village where many Etruscan and Roman archaeological remains have been found and in fact the town’s structure is typically medieval. For many centuries it is very likely that Monte Calamita and consequently Capoliveri were attached to the rest of the island by a thin strip of marsh land, or even entirely surrounded by the sea and so this being “free” and detached could be where it get its name from. 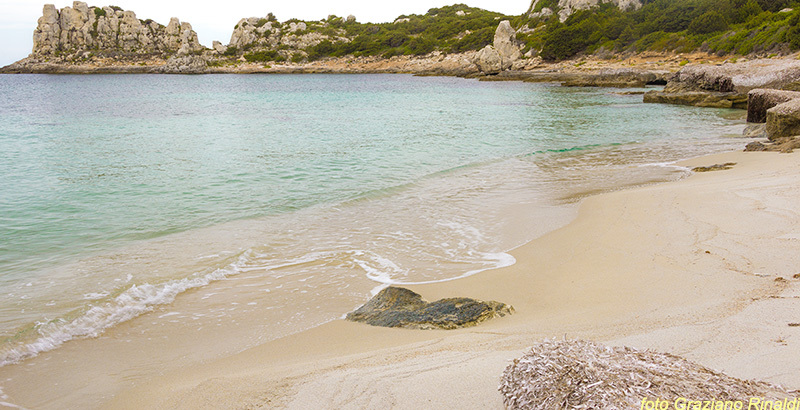 Sometimes the small beaches are so rugged that not even the residents know them well, and Cala Peducelli is one of them, it is a tiny beach surrounded by low rocks creating inlets and lovely flat rocks. If you visit Capoliveri at night in high season (July-August), leave your car in one of the parking lots outside the town then you will have a ten minute walk to the centre, or wait for the little shuttle bus that runs between the parking area and the town centre, the same bus operates from the village to the main beaches, which are 3 to 5 Km away. 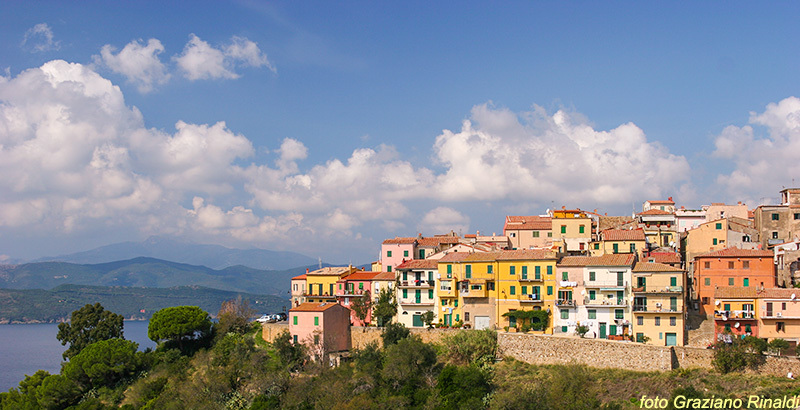 You will find good restaurants and pizzerias, as in all the villages of Elba, tucked in to a maze of medieval narrow streets and covered passageways with an amazing view from the square over the western point if the town. Stop at sunset during the early evening light, to look over the spectacle of tightly packed roofs and the wide panorama of bays and sea, it makes even the slightly difficult parking situation worth while. If you find yourselves near Cavoli, a beautiful beach on the southern side of the island in winter or in spring there is an undemanding trip you could do to the ancient granite quarries, its not recommended in summer because of the heat. For information and pictures see this article. If instead you find yourself in the midst of summer heat and are looking for something cooler, you can climb up from the town of Marciana to the church of the Madonna del Monte. At the start of it you will be already at 400 meters above sea level. You will enjoy visiting this village with its small medieval fortress and the itinerary starts in the cool of chestnut trees. Before arriving at the sanctuary there are some areas exposed to the sun, but the height and the wonderful view mean that you are distracted from the heat. Arriving at the church you can find a lovely seventeenth century font in the square with a source of pure mountain water and you won’t have walked up more than 200 metres in altitude! If you are in Marciana and just can’t find the will to do these 30-50 minutes of walking, you can always enjoy the town, or the National Park visitor centre, or perhaps enjoy a drink at one of the bars with panoramic views … and those who want to go will go. Lets say that now, you are in Porto Azzurro, so here don’t miss the easy short walk from the edge of the town (15-30 minutes) to the beach of Barbarossa. It starts from the eastern end of the village, that is to say, you go from the square along the harbour towards the fishing boats and even this is a very pleasant walk. At that point the road ends, behind the pier, towards the open sea, you will notice a tiny clean beach which is Pianotta. Continue on until you find a concrete staircase that becomes a path. It is not a trail for experts, but rather for Sunday walkers, nevertheless its very pleasant. The scenic walk is alongside the sea, and the views of the rocks and landscape are wonderful The route runs around the seventeenth-century Fort San Giacomo, now a state prison, you will see the imposing walls, ancient and modern watchtowers, the barbed wire and the ramparts. Then you come down the path to the beach at Barbarossa. Finally we suggest an easy walk in the centre of the island, near Portoferraio, a popular route for residents, footpath 108. Leave your car at the junction between Enfola and Viticcio, in this case calculate 15 minutes to the path, or leave the car directly in the area facing the offices of the National Park. From there you immediately get on to the footpath which takes us into the Enfola peninsula, the 108. This hill is called Enfola (from Insula = Island) because of the narrow isthmus that links it to the rest of the island, it is a beautiful walk and reasonably flat, very scenic and partly surrounded by tall pine trees. Along the way you’ll see the white cliffs to the south of Portoferraio with the beautiful Sansone beach in the foreground, to the north the great gulf of Procchio and the massif of Mount Capanne. Arriving at the top you can choose to continue to the right doing the full tour, calculate about 15 minutes longer than the climb and descent 40/60 (slowly), or stop at the picnic area at the top. If you opt for the complete itinerary go down into the woods and after a few minutes you will find a new crossroad, on the left you will close the circle by returning to the picnic table, left again you go down for 15-20 minutes along a steep path toward the cliff. Keep hold of children’s and do not make noise, because there the gulls nest here. On the tip of the promontory there is a granite rock called “La Nave”, a few metres from the cliff edge. From your picnic table, you can admire the Viticcio gulf with all its tiny inlets. You should consult these three articles where some little known and rather hidden beaches are described.